We are glad to invite you to participate in the Automania XII exhibition which will be held on May 23-29, 2016 in Yekaterinburg, Russia. AUTOMANIA is the annual exhibition of art projects in transport design. You can present at the exhibition both concept arts and finished projects. Pay attention to the composition of your poster or sketch-board that represents your ideas. 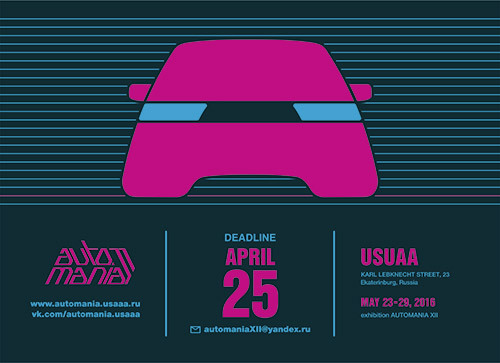 To participate in the AUTOMANIA XII exhibition please submit your application and your works to automaniaXII@yandex.ru with AUTOMANIA XII mark in the e-mail subject. - text file containing basic information: your name and surname, address, date of birth, occupation (education, employment), contact e-mail. Deadline for your application: April 25, 2016. If you have any questions please do not hesitate to contact AUTOMANIA organizers directly (automaniaXII@yandex.ru). International association of automobile designers «AUTOMANIA».